The Allied Museum (Alliierten Museum) covers the history of the American, British, and French forces who occupied West Berlin and West Germany during the Cold War, between 1945 and 1990, and beyond. Learn about the 50-year political history of the Western Allies and their presence in Germany. The Allied Museum houses memorabilia and a number of important documents from the Cold War era in what was the Americans’ Outpost movie theater. Highlights include the first control cabin at Checkpoint Charlie, a Handley Page Hastings British plane used during the Soviet blockade of Berlin, a Berlin spy tunnel, and the first satellite image of Berlin from CIA archives. The Allied Museum offers guided tours to groups, and these typically include a discussion of the Allied presence in Berlin during the Cold War and a look at important pieces of memorabilia. Admission to the museum is included in the Berlin Pass, along with city highlights such as Berlin Cathedral (Berliner Dom), Checkpoint Charlie Museum, and Pergamon Museum. 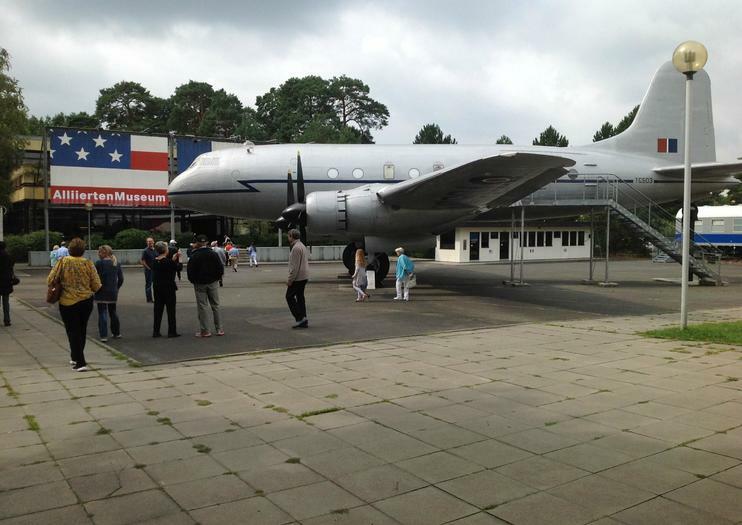 The Allied Museum is a must-visit for Cold War history buffs. Admission to the AlliiertenMuseum is free for all guests, and guided tours are available with prior arrangement two weeks in advance. The Allied Museum is wheelchair accessible, though some displays are not visible from wheelchair height. The Allied Museum is located at Clayalle 134 in the Dahlem neighborhood in southwest Berlin, within walking distance of the Brücke Museum. To get there by public transit, take the U3 to Oskar-Helene-Heim or bus 115 or X83 to the AlliiertenMuseum stop. Free parking is available on-site for those who would prefer to drive. The Allied Museum, which is open every day but Monday, is rarely crowded, making this is a good sight to visit in the middle of the day when blockbuster sights are at their busiest. The Allied Museum stands in the neighborhood of Dahlem, in what was the American sector of West Berlin. The permanent exhibition is housed in the Outpost theater, used by American troops from 1953 until the end of the Cold War. The US Army also built a shopping mall and a library in the space, bringing the comforts of home to the war-torn city of West Berlin. Plukk opp en Berlin Sightseeing Pass for ditt besøk i Tysklands hovedstad og få gratis inngang til mer enn 50 av byens toppattraksjoner. Velg et 2-dagers eller 3-dagers Berlin-bypass for å komme deg til steder som Checkpoint Charlie Museum, Berliner Dom og Museum Island - et av stedene på UNESCOs liste over verdensarvsteder. Med passet kommer du også til å se byen på en hop-on hop-off tur, et cruise på Spree River (bare om sommeren) og gratis bruk av offentlig transport i Berlin.